Let's start with the Cocoon Dress hack. I raised the neckline added a turtleneck and lengthened the sleeves on this hack for Wilma. I also lengthened the front piece and the shape is a little less cocoony on this one compared to the original pattern. If you make this type of neckline adjustment make sure that your fabric has (enough) stretch - or else it's going to involve a little violence to pull over the head....says the women who didn't check the stretchability prior to sewing. No child was harmed during the process. Okay, a nose might have been slightly bruised. Well, you live and learn. The beautiful black not so stretchy jersey with silver shine is from Stofdepotet. The sweet kimono is the recently released Fishtail Kimono designed by Chalk And Notch. I sewed this size 10 up in a very stretchy dotted rayon jersey (ha, perhaps I should have switched fabric for these makes). I had a little trouble getting the front band to fit the cardi. I had to cut a little length off the cardi as the band was to short. I haven't double checked but it might have been me tracing the wrong band size. No matter what the outcome is so so so sweet. I adore the tiny gathers and lowered hemline on the back. I will definetely make Wilma a woven version as well. Have a nice christmas/jul everyone. For me it was love at first sight when Lotta Jansdotter presented her first fabric collection 'The Premier Collection' back in late 2011. I was slightly obsessed with Lotta's 'Ruta' fabric from that first collection and made matching mother and daughter dresses (awr, that tiny Wilma). And yes, I had a giggling fan (teen) girl moment when Abram's Books and Windham Fabrics invited me to participate in this 'Lotta Jansdotter's Everyday Style' blog tour! In 'Everyday Style' Lotta shows us how to make simple, stylish and functional everyday garments. Tunics, bags, jackets, skirts and trousers are all modeled by 'real people' including Lotta herself in this hardback book. Lotta creates surface patterns and designs that are printed on numerous of goods; fabric, cushions, paper goods etc, but she's has no experience in designing sewing patterns, so she invited Alexia Abegg on board for that part - and together these two talented ladies have translated Lotta's visions and style into clothing patterns. I was tempted to give the Wilma Tote Pattern a go. A tote with the same name as my daughter is hard to turn down, but I ended up making the Esme tunic/mini dress as my first project from the book. By the way, the patterns are presented on full-size pattern sheets. Me like. I lengthened the pattern and lined the dress using this brillant method - no other alterations were made to this size L Esme. I love the fit of the dress. I've made a fair share of a-line shift dresses, but I can truly say that this is one of the best fitting shift dresses I've made. Probably the best. I adore the neckline, the bust darts and the fit across my shoulders. Just perfect! I definetely need more Esmes in my life. The fabric is of course also designed by Lotta Jansdotter. It's called Hemendu (in the Midnight Navy colourway) and is from her 'Lucky' collection. 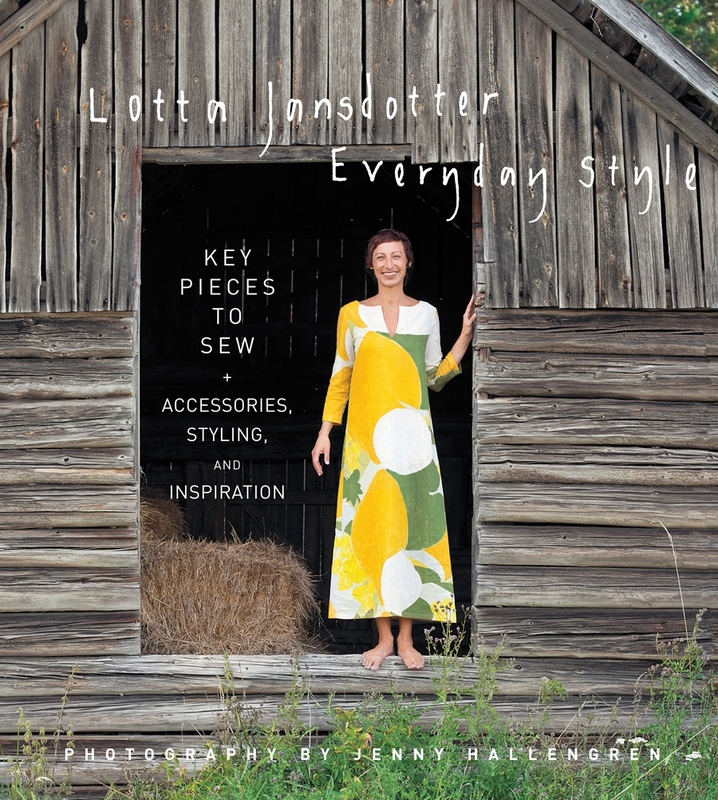 Want to win a copy of Lotta Jansdotter's Everyday Style? Believe me - you do! Well, simply leave a comment below to win not only a copy of the book but also: a fat quarter of Lotta fabric, Lotta temporary tattoos and Lotta washi tape. Update on Dec 17: The lucky winner is comment no 19 - Gretchen! Congrats, Gretchen - email on the way. Young Miss Wilma got herself a new comfy outfit. The hi-lo sweater is the newly released Mini Briar designed by Megan Nielsen. The Mini Briar is part of Megan's brand new and first collection of children's wear patterns which also includes the Mini Tania Culottes and the Mini Virginia Leggins. As indicated by the names the children's wear patterns are 'Mini Me's of Megan's very popular women's wear patterns. The Mini Briar pattern includes options for different lengths, neckline finishes, sleeve length, elbow patch, patch pocket and some applique templates. This sweater is made with loop back terry from Stofdepotet - sold out I'm afraid. Wilma who is 8½ and 142 cm tall has narrow shoulders and upper body, so I chose to make her a size 8/9 in width and lengthened the cropped sweater to a size 10/12. Perfect fit! Wilma prefers to wear her pants low on her hip, and therefore I found the sweater to be too cropped for these Danish winter months, so I added a band to the bottom of the sweater = no tummy flashing. As requested by my 17 year old - a pair of white pants. Luna had been begging me to make her a pair for quite some time now, we just hadn't come across the perfect pattern. She had an idea in her mind; the pants could not be too baggy, but not fitted either. Recently I bought myself a new pair of black pants - and it was just the kind of pants Luna had in mind. Crepe fabric, not too roomy, not to tight and with a cool front pleat/fold detail. ...and what do you know - Etsy seller EMpdfPatterns has a pattern that fits the bill! All the details are there, the pleats, the elastic at the back waist, the pockets, the tapered legs. I did alter the pattern a bit. I was concerned about the back rise of the pants so I added a couple of centimetres. Both Luna and I have a pretty long rise - and the alteration worked as hoped. On the pattern photo the pants look cropped. They are not. Luna is 180 cm tall and the pants are full length on her. She doesn't have extremely long legs, but they are absolutely not short either. I did taper the pants some from the knee down though to make them more fitted. The instructions tell you to add elastic to the back of the pants. That was not necessary for 'us' - so, no elastic just a side zipper in this pair. The fabric is a heavy poly/rayon crepe from Stofdepotet. She is so pleased with the result. The fit is really great. I have a feeling that I'll be sewing more of these.